Comfort is great and all, but sometimes a little discomfort can be good, too. Perhaps I should explain some. Getting out of our comfort zone is where a lot of important growth occurs. The third week is challenge week at camp. We’ve unified and begun building our community; this makes a great environment for the boys to challenge themselves! The third week of camp can be a challenge on its own, honestly. It always seems to be around that time that people have adjusted, the initial excitement has faded, and little irritants can seem huge. 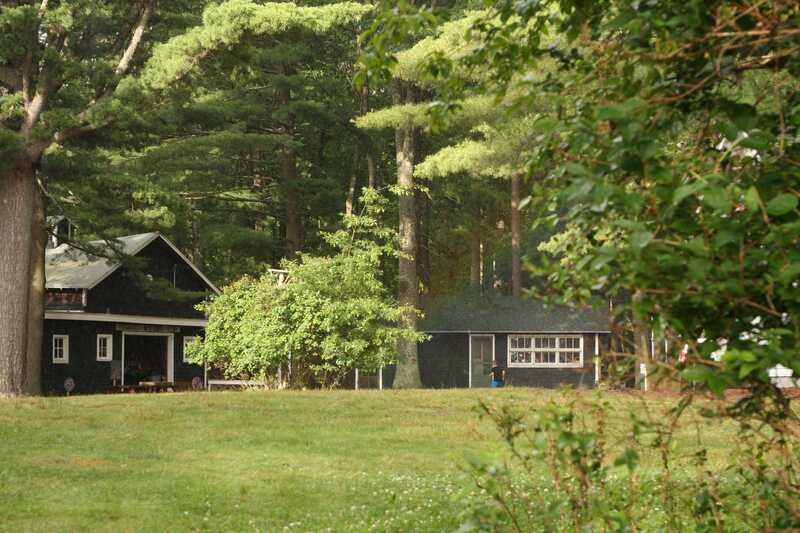 This might be a form of culture shock, following the natural patterns of major life events and moving to a new place. According to the U-curve theory of cultural adaptation, the first stage is excitement and euphoria regarding a new situation and experience. The second stage is when one begins focusing on the negative side of their new environment; new customs, foods, and rules can be stressful. The final stage, after the slump, is ultimately adaptation. The individual comes to terms with the good and bad of the new situation and is able to apply their new knowledge positively. This happens differently and at different paces for everyone, but in my experience, taking on a new challenge can not only reduce some of the stress of the adaptation process, but it also can make the whole process more meaningful. And it is a great chance for personal growth! For example, the tried and true method for dealing with homesickness is to keep busy or to try a new activity. This isn’t just a distraction; it allows a person to associate the new experience and place with positive growth and success. Since there is already some discomfort at this stage, it is a relatively small investment to try something new, and the potential rewards can be great. The third week is the start of our second session, so the boys can change a great many things about their day-to-day routine: new activities, new workshops, new special events. Succeeding in a new area can do wonders for a little bit of misgiving. This is also the week when our older boys go on a special adventure: The Ropes Course. This optional outdoor adventure program allows older campers to press the boundaries of their comfort in a totally different environment. I went along with the guys last week and was proud to see the hard work and improvement first hand. 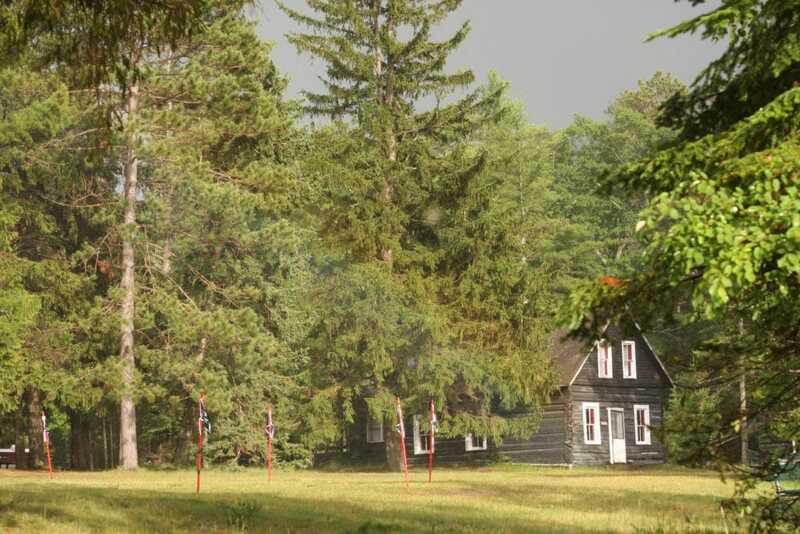 Based outside of Rhinelander, the outdoor education facility hosts many different groups over the summer. The morning features trust and team-building activities, and the afternoon involves a variety of high-wire challenges. 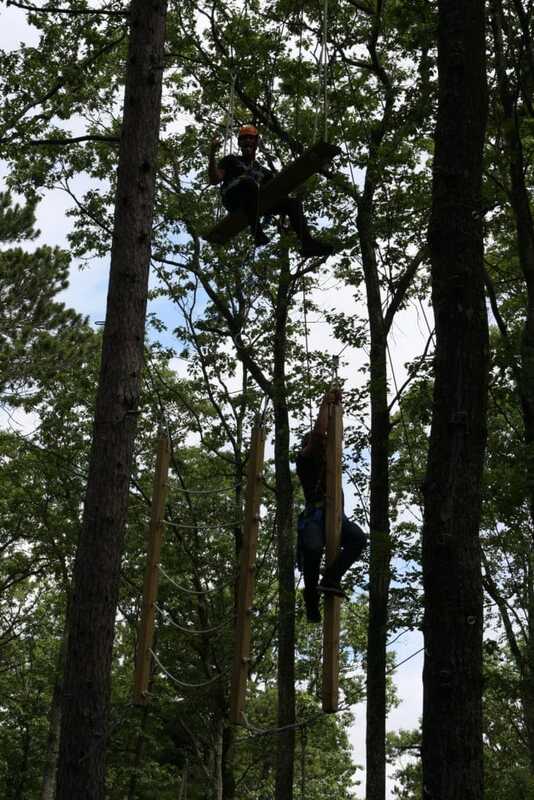 Heights are a natural fear for many people, so participating in these activities is a great, and safe, way to go a little outside one’s comfort zone and discover something new about themselves. Since we had an older group who already were pretty close, we spent more time in the air than on team building. First, the boys were challenged to transport a beach ball from one spot to the other, each person touching it at least once and without it touching the ground. Next, they were tasked with doing this without any hands! The coordinators were so impressed by the teamwork, we moved on to more sophisticated tasks. Before lunch, the boys worked their way up the “vertical playpen” in two-man teams. This is much harder than it looks, and at times it requires the two to problem solve to reach the top. 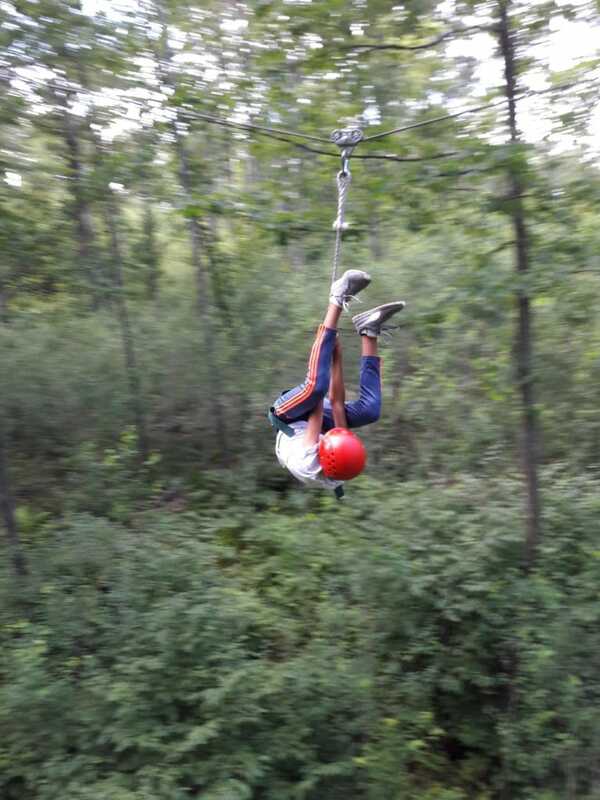 In the afternoon, we hit the zip line. This involves a climb to the tower top, followed by a sheer drop and a long slide down to the other side. I had a great view from the recovery tower, and I can say, pushing oneself off that ledge is no easy task, but every one of our guys who climbed that tower took the plunge. 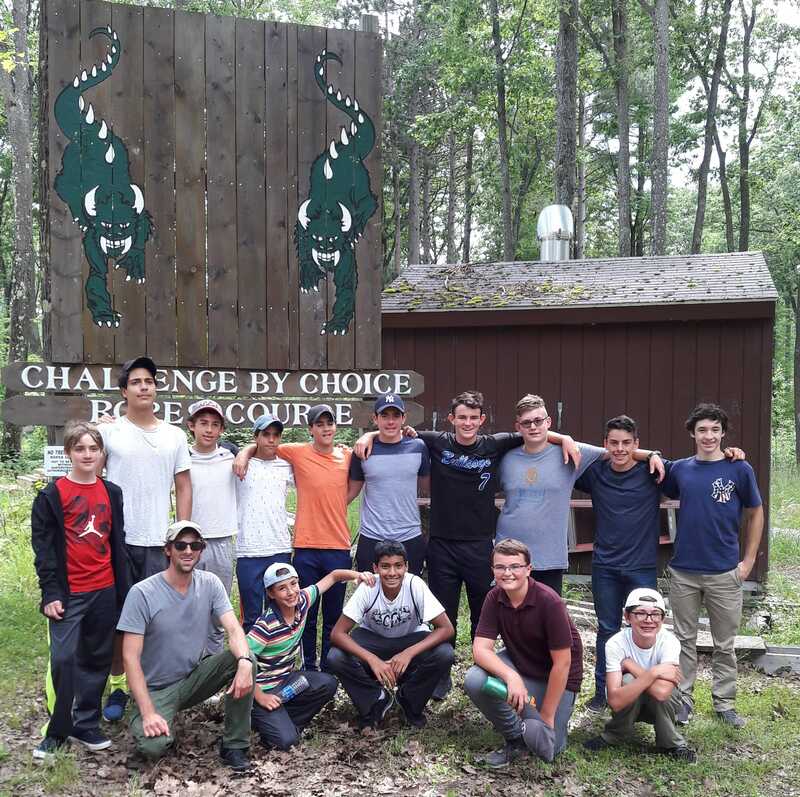 The motto, as you can see, is “Challenge by choice.” This means that every activity is optional, but every individual is encouraged to take a step out of their comfort zone (in a safe and controlled environment). The idea behind it being that the accomplishment of doing something new and challenging is more meaningful with ownership and agency. 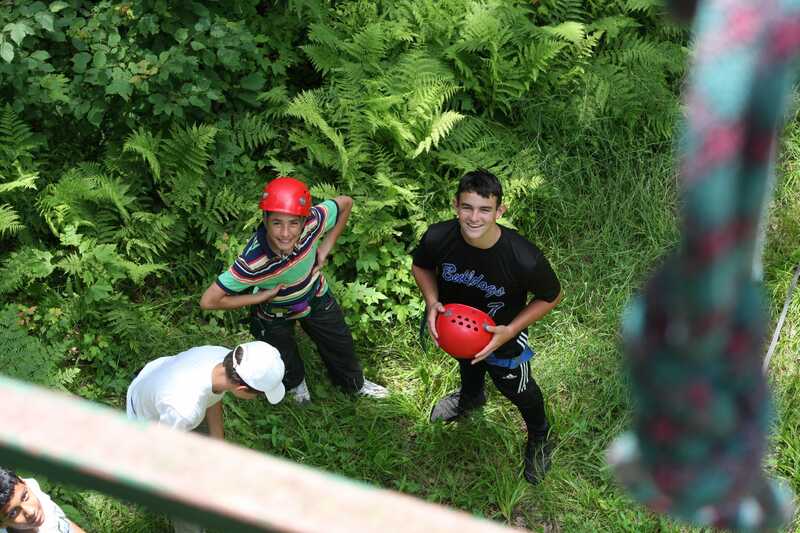 The boys choose to participate, to challenge themselves, and therefore, the victory is all theirs when they plummet from the zip line and experience the leaves rushing past them, soaring across a forested valley. Growth isn’t always easy, and neither is adapting to a new situation. But we can learn a lot from a little bit of discomfort. This doesn’t mean that we should take silly risks or be reckless when caution is needed. It just means that we should be willing to suffer a little bit of discomfort at times for greater gains. Challenging ourselves means recognizing that the reward is worth the risk sometimes. I think that we can recognize these situations from an early age, but kids count on us to help them distinguish challenges from dangers. The difference between which we have learned through our challenges, successes, and failures.